Konkani cuisine is known for its liberal use of coconut [various forms] in different preparations. Most of the curries make use of ground coconut paste called massollu. The basic massollu consists of grated coconut ground with red chilies and tamarind. The difference in taste is based on use of variety vegetables in combination with beans and pulses. The flavor of the curry gets enhanced by different type of seasonings. We call the curry with mustard seasoning as ghashi, with garlic as koddel or bendi and with onions as ambat. [Didn't know this classification till I began cooking by myself]. 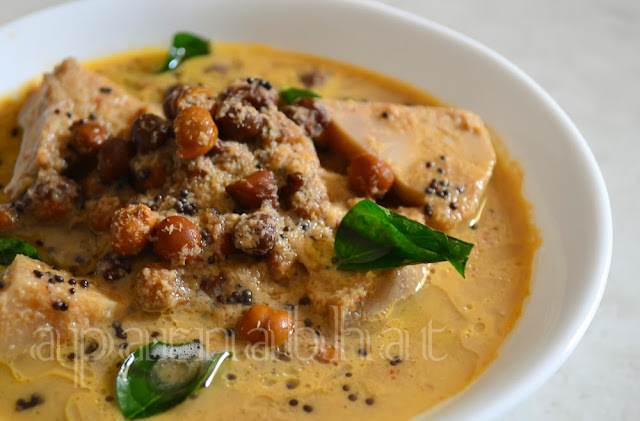 Ghashi is a preferred curry for the festive occasions or religious functions, because it is made without onions and garlic and is served with rice for main meals. Chane kadgi ghashi is prepared from brown chana and kadgi [raw jackfruit]. Since kadgi [raw jackfruit] is seasonal you can substitute it with yam, potatoes or raw bananas. Clean, wash and soak chana for overnight in enough water. Next day, wash and pressure cook till soft. [Take care not to cook them mushy]. Rinse the canned jackfruit chunks and cook them in enough water for 2-3 minutes. Mix boiled chana to this vessel, add salt and keep it on sim flame. Meanwhile, roast red chilies in a drop of oil. Once cooled grind it with thawed coconut/fresh grated coconut and tamarind to a smooth paste. Add the ground paste [massollu] to the cooked chana kadgi mix. Adjust the water [Preferred consistency for this curry is thick, so take care not to make it watery]. Bring it to a boil. Switch off the flame. Prepare the seasoning with mustard seeds and curry leaves in coconut oil. Pour it on the curry and keep the vessel closed with lid. [This allows to retain the flavors of seasoning ingredients and curry/gravy gets infused with those flavors]. Serve the ghashi hot with rice. Wow !! Lovely dish. 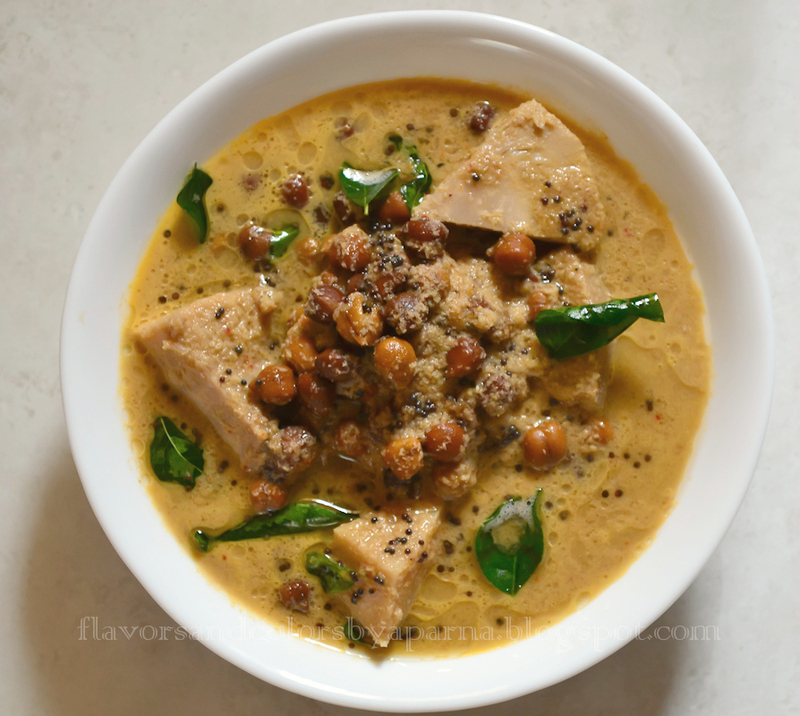 Looks yum dear and simply seeing the curry leaves and the coconut along with chana is very tempting for me :) Do send more recipes to WTML !! Thanks Avika. Will try to send in more to WTML.